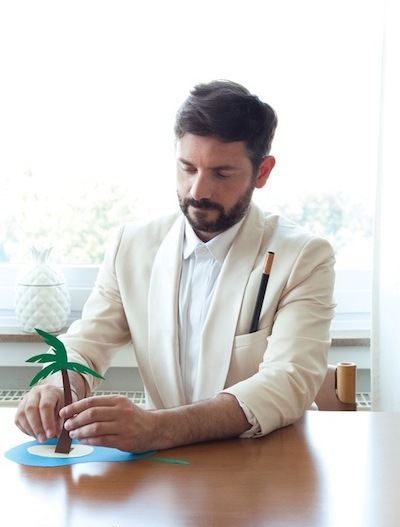 After months and months of anticipation, many mixtapes and a bunch of crazy remixes, Belgian rising star of Nu Disco The Magician aka Stephen Fasano, formerly one half of Aeroplane, is finally ready to introduce his long-awaited solo debut, the single “I Don’t Know What to Do”. He dug into his eclectic bag of tricks to conjure up a devilishly tasty record, featuring vocals by Danish artist Jeppe Laursen. The single, which will be out on legendary Parisian label Kitsuné on October 3rd, will showcase three stunning remixes by Fabian, Plastic Plates and Second Date. The Magician made the decision to fly solo from Aeroplane only about a year ago but his has been a meteoric rise. Stephen first appeared under his new guise through his popular ‘Magic Tapes’ mixtape series available as free downloads on Soundcloud. These didn’t go unnoticed among music aficionados and neither did his stunning remixes for the likes of The Aikiu, Beni, Yuksek and Lykke Li. The Magician’s remix of Lykke Li’s “I Follow Rivers” became an instant cult hit and garnered over 3 millions plays on YouTube. The final push was the release of “Twist”, a collaboration with Yuksek which got massive airplay across clubland this summer and cemented The Magician’s reputation. With its simple yet efficient piano hook, “I Don’t Know What to Do” is a pure disco-house jewel enlightened by Jeppe’s voice. The club mix and the remixes by Fabian and Plastic Plates, are punchy electronic excursions and are perfect peak time club bangers.